Hoist elevators are often needed on construction sites to lift tools and materials to the areas they are needed during construction, and at Sims Crane & Equipment, we can outfit your team with the material hoists you need to get the job done. 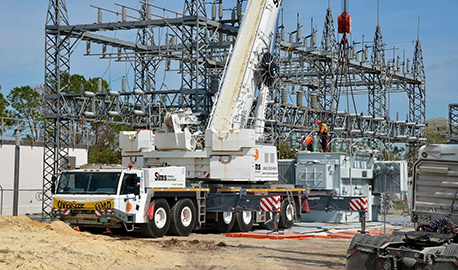 For nearly 60 years, Sims Crane & Equipment has provided Florida contractors, builders, and developers with the industrial equipment they need to complete the construction of amusement parks, government buildings, bridges, retail spaces, high rises, and more. We offer comprehensive crane service, sales, and industrial equipment rentals from each of our 13 Sims Crane & Equipment locations, and our experts can provide you with all of the equipment and services you need to complete your construction job on time and on budget. With a material hoist on hand at your construction site, you can work more independently and improve productivity. At Sims Crane & Equipment, our hoist elevators allow you to control your material delivery and eliminate time spent rigging and re-rigging materials. We have options designed to move materials quickly, as well as options that allow for maximum lifting capacities. Additionally, our hoists are able to move materials up to 400 ft. in a single run. Hoist elevators are available for daily, weekly, and monthly rental periods and can be rented with an operator or as a bare lease rental. Better still, each hoist is serviced both before and after each rental period to ensure all equipment is in top working condition. In addition to material hoists, we provide a wide range of other equipment rentals, including crane rentals, forklift rentals, and more. We also offer an assortment of services, including machinery moving, crane service and parts, 3D lift planning, and many others to better meet your needs. For these reasons and more, thousands of construction professionals throughout the state have relied on us as their single resource for industrial equipment service, sales, and rentals. We gladly serve those throughout Daytona Beach and elsewhere throughout Florida, so contact us today to request quotes on hoist elevators, machinery moving, crane service, or any other needs you might have.